Something very different for the home fruit grower - real Almonds right here in the UK. Glorious white and heavily scented blossom too in Spring. If you are looking for somethinhg novel and new to grow, why not try our fabulous dwarf self-fertile Almond, called 'Garden Prince'. It kicks off early Spring with fabulous displays of snow-white blossom - we think this alone should be a reason to grow this amazing tree. Throughout Summer, the polinated fruitlets swell and develop - their outer skins pale green and furry as they grow. 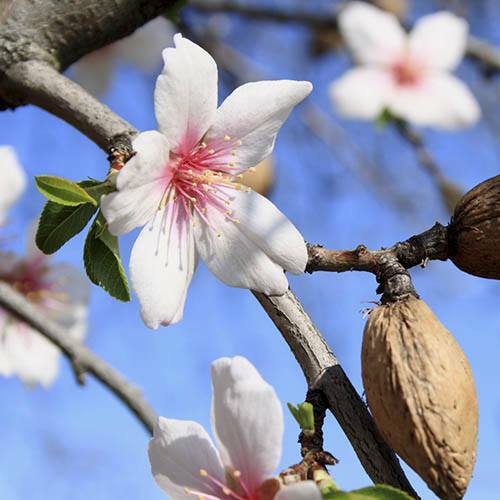 From mid-Summer onwards you can pick fresh Almonds each year once established. On a dwarfing rootstock, and a compact grower, it will remain below 1.4M for 10 years or more, making it ideal to grow in a big pot on patio, decking or balcony. It does blossom early, so beware late frosts, but it will reward your curiosity with a very unusual crop of fruits.